At the moment we are on a bit of a health kick, you may have noticed over on Instagram that we're trying to eat right and get more exercise. Generally, just yoga and walking but hey, it's a start, isn't it? Our change of lifestyle has been a long time coming but our main issue was organisation - with a few house moves and life changes we just hadn't got a handle on everything and, our eating habits went downhill. We both put on weight and when you're looking to the future, weight gain and crappy health is the last thing you want to hold you back. So retrograde ended and with that came a new found passion for eating well. Over the last week, we've taken our eating habits to the Philippines (not literally but our meals have been Filipino inspired) and we've eaten Pancit Canton, Kare-Kare and crispy sea bass with chilli, lemon and coriander sauce. What you've not seen on IG is that we've also had freshly made soups and plenty of smoothies and fruit slush desserts. There have been two things that have helped us achieve these changes, the first is ASDA home delivery - it's been a godsend. The second is our Ninja blender and smoothie maker. In the past, I've had juicers and blenders and smoothie makers and I've used them but grown bored purely because they take seconds to use but ages to clean. I don't have the patience for that in all honesty. The Ninja, however, is basically a ninja! It's super quick at cleaning which is a major factor in how much I use this. The second important factor is the speed or the usability. Again previous blenders have promised the world but fallen short because their speed was too slow and they were unable to blend correctly. 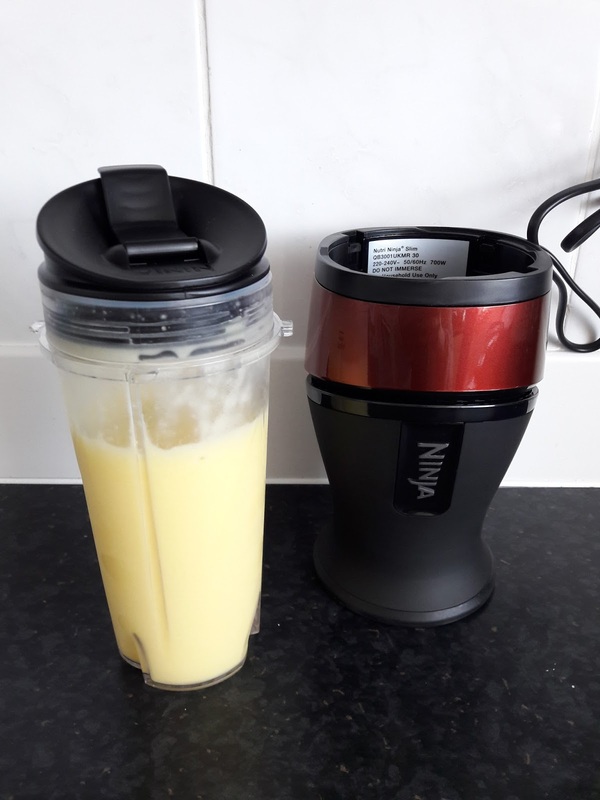 The Ninja has a 700W speed which literally takes seconds to blend up my frozen (yes frozen) smoothie mixes which typically consist of frozen chunks of pineapple, mango and other yellow fruits. Here is the video showing how easy this is to use. You simply pop in your fruits or veggies, top with a liquid, pop on the blender/smoothie lid and place the cup upside down onto the Ninja machine. To make it work you simply push down the cup and it blends the ingredients to perfection. I used frozen pineapple and mango topped with coconut milk. Blending this up you can either have it straight away by simply swapping the blender lid to an on-the-go lid. It's really as easy as that. You receive two cups and lids so you can make two quickly, pop one in the fridge or simply use one as one is being washed. So far this has been a doddle to use, takes up very little room and is helping us immensely in our pursuit of health. The blender is currently on sale for £39.99 from £49.99 and in all honesty, this is a bargain guys. You can check it out over on the Ninja Kitchen website.